I would like to be able to switch between the open windows of one application by using (or assigning first) a shortcut (like I do in Ubuntu, Linux Mint and MacOS). I have often more than one window open of one application like chrome or an IDE and I want to quickly move between them. Yes I know I can move the mouse over the icon and scroll or right click, but this involves taking my hands of the keyboard. 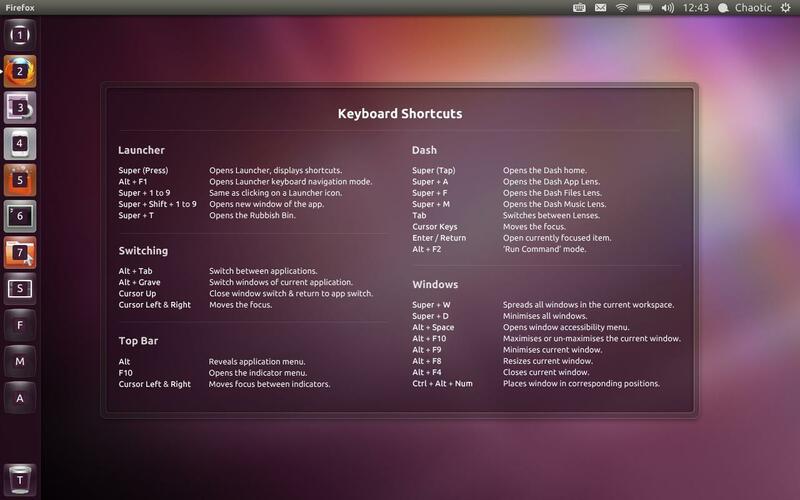 I want a keyboard shortcut like in all the other OS I'm using. Yes I know of ALT+TAB and workspaces but this is no real substitute for such a basic functionality. I couldn't find the corresponding action under Keyboard-->Shortcuts-->Windows; is it seems missing? I also don't mean CTRL+PageUp/PageDn. The behavior is not consistent and often missing. For example in Chrome this shortcut switches between Tabs and not Windows. And for elementary built in apps like Terminal or Files it is not implemented. In this list of shortcuts here the shortcut I'm looking for is not mentioned. Does anyone know maybe the underlying system command so I can create custom shortcut? Or hot to configure xbindkeys to allow window switching? Or is this functionality completely missing from elementary? Edit: Cipricus created a great answer here: How does one cycle through windows of the same application? I know Plank can do it by scrolling so is there any way I can use that to create a shortcut to switch the windows? Where could I request that feature? I know that elementary has all the nice workspaces to organize your work but I feel that is a very basic functionality missing here. MacOS also has a similar workspace organization and there the shortcut exists without problems and I make heavy use of it. How does one cycle through windows of the same application? seems to ask the same thing but its answer is the one tested and not working as indicated above: CTRL+PageUp/PageDn is not working. - Also, the source posted for that is not confirming it: it does not mention such a shortkey at all! What are the different methods to switch between windows and workspaces? - asks precisely this at its first point, that is: between windows of the same application on the same workspace (implying of course 'only between those of the same application'; without that implication, cycling all windows will eventually cycle those of the application that has multiple windows open: but that's not the point). - Anyway, Daniel Foré's answer marked as definitive gives a lot of details but doesn't answer the first point. There is no such option that you could use with a keyboard shortcut -- and probably it will not be implemented: workspaces serve precisely the purpose of grouping windows. If the multiple windows of the same application are on the same workspace, the goal is achieved with the shortcut for switching windows of the same workspace (Alt-Tab) if only that application is using that workspace. 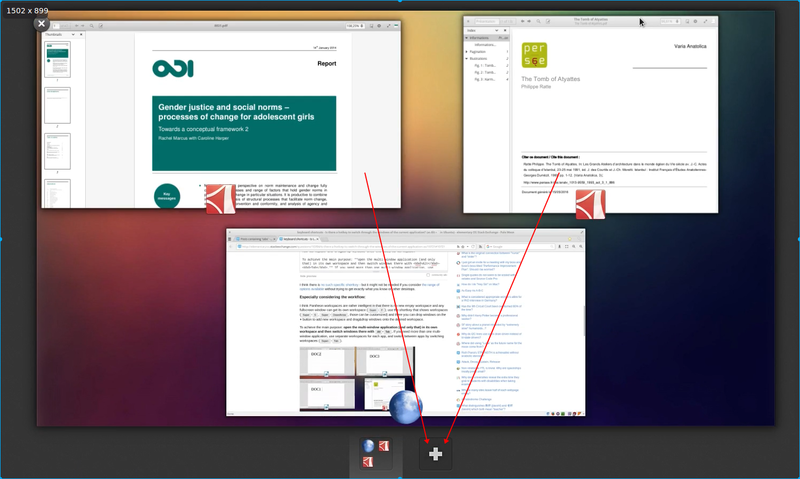 The general idea is to open the multi-window application (and only that) in its own workspace and then switch windows there with Alt-Tab. Go to the Workspace Switcher (Super-S, Super,DownArrow) and there you can add new workspace and drag&drop windows between workspaces; namely, drop the windows of your application onto the + button to add to new workspace. If you need more than one multi-window application, use separate workspaces for each app, and switch between apps by switching workspaces (Super--Tab). Note also that any window that is made fullscreen with Super-F gets a new workspace for itself. Not the answer you're looking for? Browse other questions tagged keyboard-shortcuts window-management window-manager or ask your own question. How can I add a keyboard shortcut to a plank shortcut?